Papawswrench - Dedicated to collectors , buyers , and sellers of old adjustable screw wrenches, monkey wrenches, alligator wrenches , vintage end wrenches , and others . Dedicated to collectors , buyers , and sellers of old adjustable screw wrenches, monkey wrenches, alligator wrenches, vintage end wrenches, and others. Coe's, Girard, Whitman & Barnes, Heller, Billings, Billings & Spencer, Williams, Proto, Plomb, Herbrand, Mossberg, etc., are some of the makers represented. Please feel at home and look around the site. If you don't see anything of interest, please check back soon because it can only improve in the future. 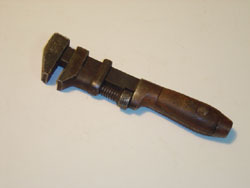 If you are interested in wrenches and other old tools, visit the Tool Talk link on the left sidebar. Tool talk is a growing forum for collectors, buyers, and sellers. Papawswrench and Tool Talk are labors of love that do not make much money, but are fun and helpful. Hosting fees and liscensing are the responsibility of the owner, but members and visitors can contribute to these costs by donating funds through the following link. Donations done this way are not redeemable by the owner, but go only towards hosting fees with Dreamhost. I have been a tool freak since 1966 when I had terrible experiences with an old Triumph motorcycle. Certain tools were required to work on that bike and others like it. Later I began to repair motorcycles for others and had to accumulate many tools. 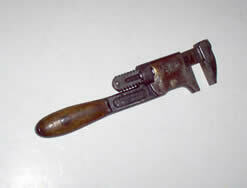 My father was a builder and his carpentry tools were fascinating in their functionality and usage. I was always curious about vintage and antique tools, especially odd ones, so I began accumulating, collecting, and selling them. I am also interested in old cameras, scales, fans, almost anything old and unusual, so you never know what I might have. I have been a Peace Corps Volunteer, a teacher, a motorcycle mechanic, a truck driver, a dispatcher, and a few other things I may not remember. I have a wife ( more than 32 years ! ), two sons, one grandson, a daughter-in-law, many friends, and lots of nieces and nephews. The idea for this website is to open an avenue for like-minded tool people to exchange information about these tools in order to help each other with finding, selling, or collecting. Papawswrench will not be a high end site with unrealistic prices, nor will it be a bargain sale of useless junk and questionable collectibles. Of course I would like to sell tools, but that is not my prime reason for this site. I am interested in monkey wrenches ( also known as adjustable screw wrenches) by Coe's, Girard, Whitman & Barnes, Keen Kutter, Billings & Spencer, end wrenches by Billings, Bonney, Craftsman, Mossberg, and others.